Arthur Nanni presenting results of UFSC Permaculture Study Group Photo: Paolo Martins. The UFSC Permaculture Study Group (NEPerma) participated on 2º Permaculture, Agroecology and environmental education Seminar, promoted by Permacultura Lab institute and Environmental education from “El Sur” Group (GEASur). 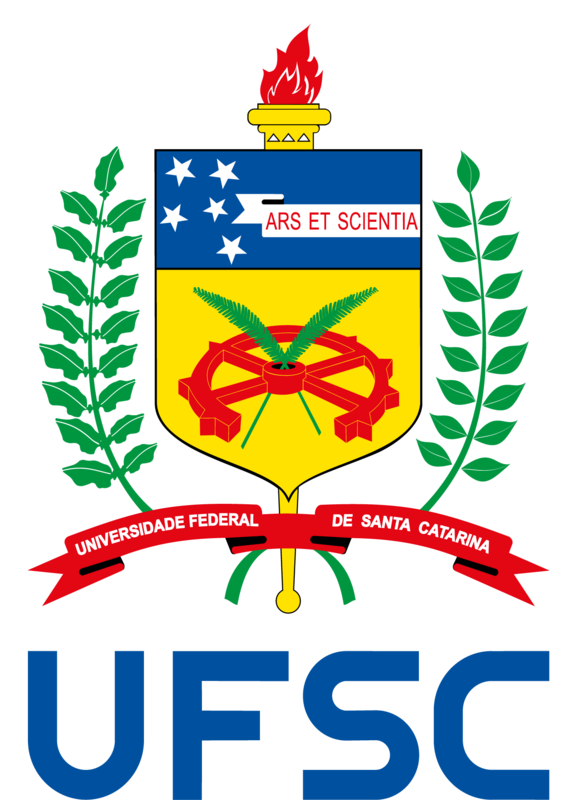 The event happened at Federal University of Rio de Janeiro State. It was presented by NEPerma the results of six years on teaching, research and extension. “Permaculture on academia” was the theme developed. Arthur Nanni talked a synthesis about permaculture initiatives on universities around world and Brazil scenarios, highlighting the results and products generated by NEPerma/UFSC. Borned in academic environment on 70’s, permaculture as a grassroots movement, is now widespread around world and present in more than 150 countries, linked basically to farms and institutes. In the past decade, a brew of teaching, research processes and application of several techniques, brings permaculture back to the academia, recognized as a holistic and socio-environmental science. Its recent insertion on academia is providing advances on adoption of its philosophy for environmental education and social organization on a sustainable way. The discussion of insertion of permaculture on academia agenda is not a recent and involves different and important aspects. One of them, is about permaculture movement/science institutionalization to beyond traditional institutes and farms, that supposes a weakening of anarchical and self management way of development originally purposed by permaculture. The NEPerma’s researchers are working on it discussion and understands the role of academia on permaculture promotion, as a technical-scientific supporter, looking for improving teaching methods and pedagogical instruments, as well as to validate scientifically used processes and techniques of land management. Thus, it is aiming strengthen through research, teaching and extension actions for both, permaculture movement and science, following such as the agroecology development on Brazilian universities and it several undergraduate and post-graduate programs. 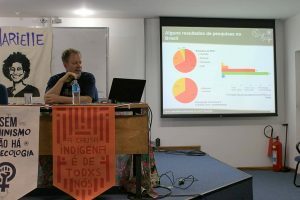 The Permaculture on academia lecture’s content is described on article Building permaculture on Brazilian academy [in Portuguese], published recently. More information about the Seminar and Instituto Permacultura lab [in Portuguese]. New permaculturists: Vinícius, Bernardo, Henrique, Danillo, Caroline, Elisa, Susana, Juceli, Grazianne, João Vitor, Lara, Larissa e Joice. Marcos Isao e Felipe not registered in this photo. 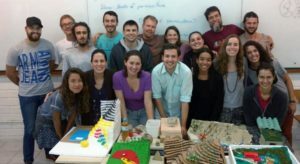 The Permaculture Study Group (NEPerma) have finished it semiannual Permaculture Design Course and certified the 11ª class of permaculturists through the discipline “Introduction to Permaculture. 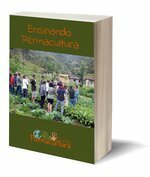 Since the begin of activities of permaculture at UFSC, NEPerma have certified more than 200 permaculturists. These new permaculturists had the opportunity to learn and share knowledges into 90hours of PDC, coordinated by permaculturist and Prof. Arno Blankensteyn. More 12 instructors permaculturists have participated of this NEPerma’s PDC edition. The next edition of NEPerma’s PDC will occurs in the winter vacation period and, aim to share permaculture knowledge for Federal Universities’ professors, to purpose one permaculture undergraduate program at UFSC and build a network of permaculturists acting in professional teaching.